Though it may be of great interest to breakfast lovers, you wouldn’t expect medical professionals to be too concerned with the physics of perfect pancakes. But according to a group of researchers at the University College London, the perfect pancake recipe may hold the key to better treating glaucoma patients in the future. Glaucoma is the number one cause of permanent blindness worldwide, and as of now there's no way to cure it. The disease causes permanent eye damage when excess fluid builds up in the eye. The pressure this puts on the optic nerve is what eventually leads to loss of vision, and scientists believe that figuring out an escape route for the fluid could help save people’s eyesight in the future. This is where the pancakes come in. In a study recently published in Mathematics Today, researchers tested the recipes of 14 different pancakes from around the world to observe how water escaped from the batter during the cooking process. Different recipes consisted of different thicknesses and consistencies. For example, the puffy Dutch poffertjes had an aspect ratio (the diameter of the pancake to the third power in relation to the volume of batter) of three, while thin French crepes had an aspect ratio of 300. The scientists also measured the baker’s percentage, which is the ratio of liquid to flour in the batter. All of these varying factors contributed to how the pancakes cooked once they hit the griddle. According to Gizmodo, thick pancakes were better at trapping water vapor as it tried to escape upwards, creating irregular craters on the bottom side. This same process caused islands to form on the pancake's top half as it wasn’t a consistent thickness. Thin batter with a high baker’s percentage resulted in pancakes with lots of tiny brown spots and a dark ring around the perimeter where the batter was the thinnest. This type of pancake was thin enough to allow water to pass through it, leaving small channels along the top surface where the vapors had escaped. 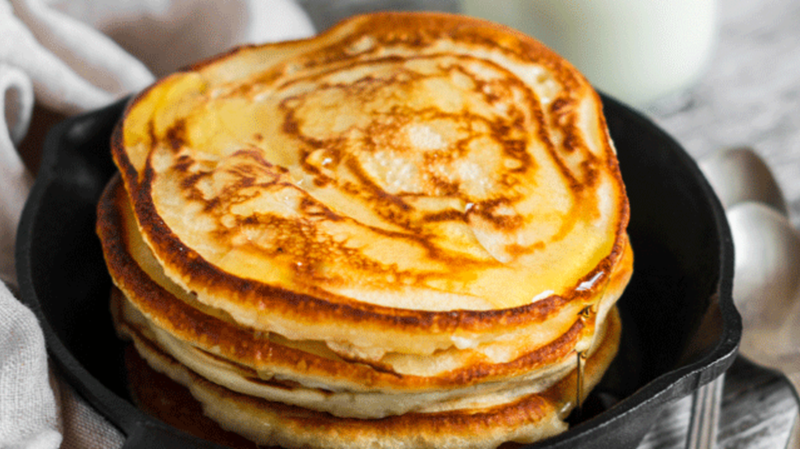 Thin pancakes with a more mid-level baker’s percentage allowed water to escape smoothly through them while browning evenly at the same time. The goal of studying all this delicious data is to help scientists better understand how flexible sheets, like the eye's retina, interact with fluids and vapors like those caused by glaucoma. This information could lead to better surgical treatments, which would mean less vision loss in the future. The findings could also be useful to people looking to improve their pancake game. (Just try not to think of eye fluid buildup when you’re in the kitchen.) You can watch study co-author Yann Bouremel whip up the scientifically significant breakfast in the video below, and you can see the full study here [PDF].